The original beauty and innovation of vehicles was seeing just how fast you could get from one point to another– but what good is that if you cannot stop when you get there? Of course, this issue is why brakes have been an integral part of the modern vehicle since its inception. There is a reason many vehicles are rated on the tame it takes to go from zero to 100 km/h as well as how quickly it can do the opposite. Stopping distance and time is directly tied to the condition and effectiveness of your braking system. 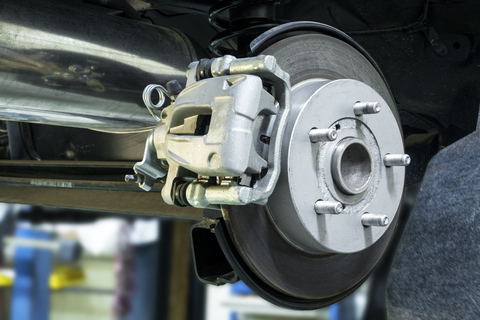 Read on for Park Muffler’s crash course on the components of your vehicle’s brakes so that you can better understand what goes into their proper function. Braking starts with pressing the brake pedal, which initiates a domino effect throughout an intricate hydraulic system– from under your foot to all four of your vehicle’s wheels. The pedal’s piston increases pressure on the hydraulic fluid inside, which activates the master cylinder. Modern brakes are power-assisted so that you do not have to press as hard, but either way the main cylinder then branches off into brake lines that are connected to the individual brakes attached to each wheel. Hydraulic fluid runs through these lines and makes sure the pressure is applied evenly, often with the assistance of a modern vehicle’s electrical system. A relatively recent innovation, disc brakes become popular among consumers during the vehicle boom of the 1960s. Disc brakes were originally used in racing due to their high performance, but have since become the modern standard thanks to more sophisticated engineering and more durable materials. The rotor or disc spins at the centre of the wheel, straddled by a caliper– a sort of clamp that is fed by a brake line. Once the brakes are applied, the hydraulic fluid moves to the individual cylinder in the caliper. This causes the caliper to squeeze two brake pads inwards on the rotor, creating the necessary friction for the wheel to stop spinning. Most contemporary vehicles feature disc brakes on the front two wheels, if not all four. Drum brakes were the very first widely adopted method of stopping a vehicle in its tracks. While still effective, drums simply do not achieve the high end performance of disc brakes. Rather than squeezing inward, the wheel cylinder pushes outwards when the brake pedal is applied. This moves two large “shoes”– another form of brake pad– against the spinning outer drum, creating friction and slowing the wheel down. Very common in older models, drum brakes are now likely only installed on the back two wheels of a vehicle in conjunction with frontal disc brakes. Stopping our vehicles is key to the health and safety of everyone tied to our driving society. Now that you know a little more about how brakes work, feel free to bring any questions or concerns about your vehicle’s braking system to the attention of our experts. Contact or visit Park Muffler today!